Zesto, Evansville IN – Marie, Let's Eat! For our last stop on the first night in Indiana, I combined two of my interests into one stop. In the summer, I had a breaded pork tenderloin at Cannelton’s popular Walls’ Drive-In. These are much-loved in Indiana and Iowa, and if you are able to watch this terrific short documentary about the sandwiches by Jensen Rufe without wanting to book a flight to Bloomington, you’re stronger than I am. If you don’t have twelve minutes, look over this essay from Serious Eats. Don’t these look delicious? Anyway, I wanted a couple more tenderloin sandwiches. 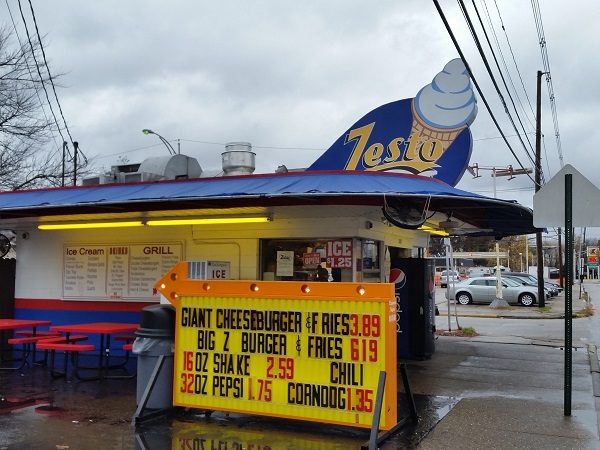 I’m also quite interested in the old Zesto chain. As I’ve mentioned in previous stories about the Zestos in Atlanta and in Columbia, this is a really peculiar little situation. Sixty years ago, Zesto was a large, nationwide chain, and when it disintegrated, it did not leave behind quite as many individual stores as it did mini-chains. So the two surviving Zesto restaurants in Evansville are one chain, and the five in Atlanta are another. Columbia’s stores are owned by different families, so they’re not really a chain at all, which makes this even more odd. Then there are really peculiar mutations of Zesto, where new owners along the line dispensed with their name for legal reasons and asked a local sign company for a quick fix, so there’s a Besto in Anderson SC and a Frosto in Crowley LA, and possibly several others over the decades that we don’t know about yet. 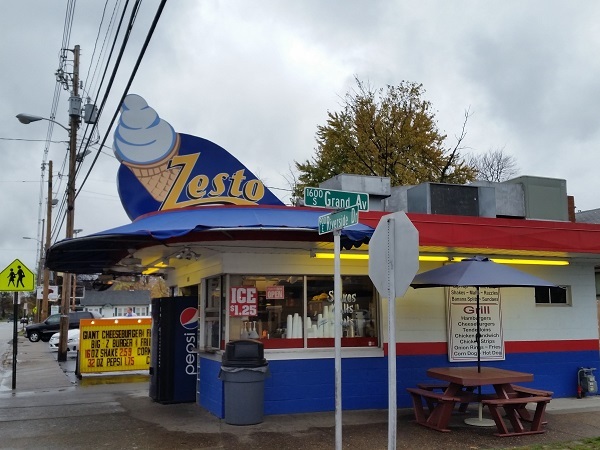 Anyway, give me an opportunity to visit a Zesto, and I’ll take it. These days, there are two Zesto locations in Evansville, on Franklin, and the one that we visited on Riverside. The Riverside store was the third in the city, and I picked this one because I looked in Google’s street view and liked the building better. I joined a small crowd waiting for burgers and ice cream, and took my tenderloin sandwich and milkshake back to our hotel. The sandwich was okay. It was better than the disappointing one at Walls’ place, but it wasn’t made fresh. I have the bad feeling that my experiences with tenderloin sandwiches would be like telling somebody in Indiana about all the great pizza in Georgia, and some food blogger from Indianapolis coming to Rossville, Fort Oglethorpe, and Ringold and reporting back on how the pies that they’ve found are nowhere near as good as their reputation. 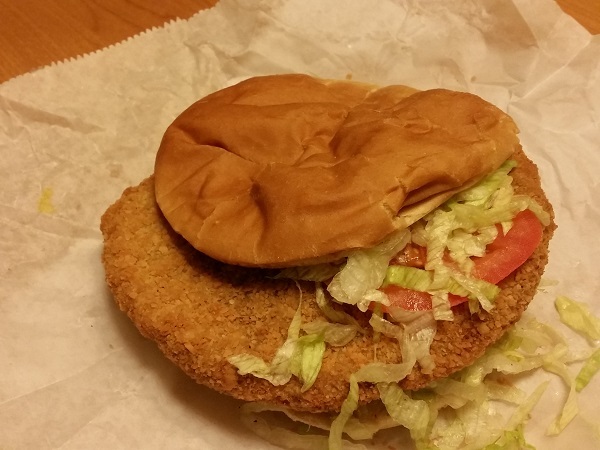 Evansville – and Cannelton – are not where the best of these sandwiches can be found. Check out Rick Garrett’s fabulous, fabulous blog about them, and notice what cities are not represented on it. Perhaps one day, Indiana’s tourism department will send us a nice stack of hotel and airfare vouchers so that we can really dig into these sandwiches the way that they deserve. But while it’s possible that Evansville may buck the state’s reputation for this regional treat, in the next chapter, I’ll tell you about a regional specialty that we did not sample! Stay tuned! Posted on January 2, 2016 August 24, 2017 by Grant G.Posted in dairy bars, indiana, regional chains, sandwichesTagged breaded pork tenderloin, dairy bars, dessert, evansville, indiana, regional chains, sandwiches. That pork sandwich looks too perfectly round to be handmade. That’s sad. Your mistake was getting the tenderloin instead of the Old Fashioned Burger. I use them as a standard to judge all the others.